On Thursday at the annual press conference in New York, Ken Griffey Jr. confirmed that he will be inducted into the Baseball Hall of Fame as a Seattle Mariner. 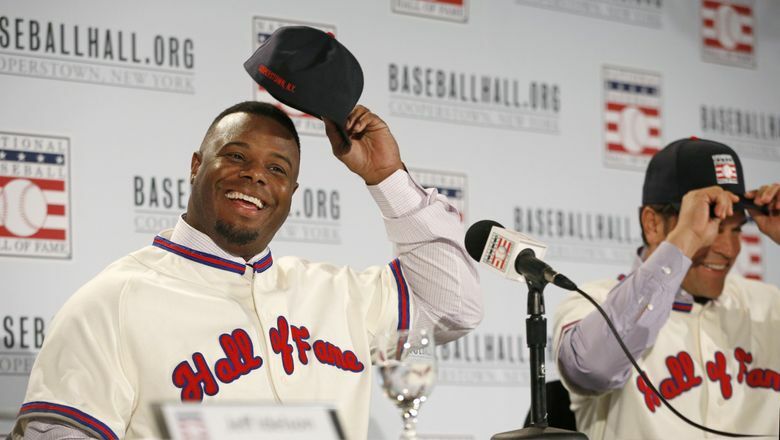 There never really was concern about which hat Ken Griffey Jr. would wear on his plaque in the Baseball Hall of Fame. Perhaps the bigger question was if that cap will be backward. On Thursday at the annual Baseball Hall of Fame news conference in New York, Griffey confirmed what long had been expected — announcing he would be inducted into the Hall of Fame as a Mariner. “I’m going to go into the weekend with a Seattle Mariners hat on,” he told reporters. Griffey put his official Hall of Fame hat on backward at the beginning of the news conference and flashed that familiar, wide smile. Will his plaque have his Mariners hat backward in the popular style of his youth, a style kids emulated and the old guard rolled their eyes at? Seattle fans don’t care. They are just happy it’s their hat. He will the be the first Mariners player to be inducted into the Hall of Fame. Griffey’s former teammate, Randy Johnson, was inducted last year as a member of the Arizona Diamondbacks. Mariners announcer Dave Niehaus was honored with the Ford C. Frick award in 2008. Griffey set a record in this year’s voting. Of the 440 submitted ballots from the eligible members of the Baseball Writers’ Association of America, Griffey appeared on 437 for a record 99.3 percent, surpassing the 98.84 percent for Tom Seaver in 1992. It’s fitting that the Mariners’ first iconic player will be their first in the Hall of Fame. Griffey understood his importance to the organization that selected with him the No. 1 overall pick in the 1987 draft and to the community that embraced and adored his growth from talented, precocious rookie into a superstar. Griffey had two stints with the Mariners. After being drafted in 1987, he ascended to being the opening-day center fielder by 1989. It was the start of 11 seasons of greatness during which he hit .299 with a .948 OPS (on-base plus slugging percentage). He also had 320 doubles, 30 triples, 398 home runs and 1,152 RBI during that span. He also was a 10-time All-Star selection, won 10 Gold Gloves and seven Silver Slugger awards. He won the 1997 American League Most Valuable Player in a unanimous vote. During that time, he helped lead the Mariners to an improbable American League West title in 1995 and scored the winning run in the clinching Game 5 win over the Yankees in the American League Division Series. In the offseason after the 1999 season, Griffey asked for and was granted trade to Cincinnati — the city in which he was raised. He played nine seasons with the Reds, battling multiple injuries. Griffey played in 945 games with the Reds, hitting .270 with an .876 OPS and 173 doubles, eight triples, 210 homers and 602 RBI. He was named to the National League All-Star team twice with the Reds. He was traded to the Chicago White Sox for the final part of the 2008 season, playing 41 games with them. He returned to the Mariners in 2009 as a free agent and played the entire season, hitting .214 with 19 homers and 57 RBI in a part-time role. He helped the Mariners to an 85-77 record — one of three winning records since 2004. Griffey returned in 2010 but did not finish the season. With his playing time reduced and after reports of him sleeping in the clubhouse during a game, he abruptly retired June 2 that year. The Hall of Fame induction will take place July 24 in Cooperstown, N.Y. Griffey and fellow inductee Mike Piazza, will open the stock market Friday morning on Wall Street. He will travel to Seattle for a news conference early Friday evening with the local media.